I am a Senior Global Studies major, History minor, emphasizing in European Studies. I have taken various history classes that focus on the European continent. As such, I have encountered numerous works illustrating the Nazi regime and its successes and failures, but the works written by the regime’s opposition were lacking. Therefore, Richard Rashke’s Escape from Sobibor provided me with an excellent analysis of Jewish resistance and also a look into the dynamics of the Nazi camp system. With my continuing study of history I intend travel the world furthering my knowledge of other cultures while pursuing a teaching position. For this assignment I chose to read Richard Rashke’s Escape from Sobibor. The aim of this paper is to present an analysis of Rashke’s book that illustrates the resistance to the Nazi encampment system exhibited by the Jews during World War II, how it developed into and in which ways it made a collective escape attempt possible. 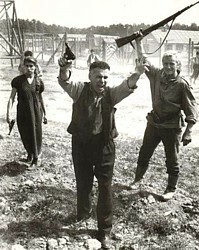 The paper claims that within Rashke’s documents there is a broad unwavering will of three different types of prisoners—the cunning, the occupationally gifted, and the militarily trained—who made it possible for a group of people with no hope whatsoever to fight back against such an oppressive and dominating force as the Nazi camp guards. Moreover, this hope that was apparently lacking is consistently depicted in Rashke’s book and described in the paper as one of many pressures imposed on prisoners in a systematized degradation of human morale, which the Jews of Sobibor were able to resist and overcome. Rashke, throughout the entire book, reiterates that those Jews who achieved success during their World War II plight did so because they were sly and adaptive. The examples of each of the aforementioned types of resistors in this book possess these traits. Initially, Rashke introduces Pechersky, a Russian POW, who is a model of the 1 st category as he deliberately defies the Nazis in order to destroy their system. Next there are Jews such as Josel who “thwart aspects of the system” by creating loopholes which defy the functions of Sobibor as a work camp. Finally there are Jews such as Shlomo who resisted the system by staying alive, outsmarting his captors and becoming indispensable. The foundation for Jewish resistance is the Survivor, because he resists with the least amount of risk to his life. The majority of resistance in Rashke’s book were men and women who simply did anything and everything they could to survive. The reward for this determination to live, and more specifically resistance to die, was escape from the camp and their subsequent freedom. The types of resistance and escape differed for each person in degree however. For the Jews in this story there was one similar element to their personality. For the majority of the Sobibor prisoners, life was lived moment to moment, every second they were able to enjoy that had too earn with the ability to adapt and deceive. On the other hand there were also those Jews who sacrificed themselves so that others could live, the ability to cope with the harsh conditions of encampment were too much to bear. Rashke explains the high level of importance that the Sobibor camp officials placed on the efficiency of production of primary level goods (i.e. shoes, clothes, etc) as it was a newly expanding camp. Accordingly, there was a great importance placed on skilled workers. Likewise, the Jews who could prove their usefulness to the guards would become indispensable. For Shlomo, his success was attributed to his childhood ambition to become a goldsmith. After compromising with his father Shlomo was allowed to pursue an apprenticeship that would become a ‘saving grace’ for not only himself, but also for his brother, cousin and nephew. Shlomo’s shrewdness carried him through the camp as he established his worth in the system. As a goldsmith in a camp full of gold he saw his chance when he “learned to spot the glimmer of greed in a Nazi’s eye” (7). After creating jewelry for the guards they became aware of his usefulness and gave him more immunity from execution with his subsequent promotion to head of the machine shop. In a position like this Jews could remain out of harm’s way as long as they did not make too many mistakes. The guards of Sobibor relished the opportunity to make an example of someone. Resistors like Shlomo have been criticized for actions in the war. This argument holds that the resistance of the Jews working in these shops was negligible as they were producing weapons and products which helped the Nazis prolong their campaign. If this is true then what should the Jews have done instead? Should they have done nothing at all or should they have fought back against the Nazis? Each option would only be a practice in futility; the Jews were rounded up with no indication that they were eventually going to be exterminated. As a result, they acquiesced to all German requests. The Nazis had specific euphemisms designed to deceive the Jews and they believed the Germans were not going to kill them even as they entered the subsection of the camp that contained the showers (i.e. gas chambers). The Jews inside Sobibor did not easily find a niche within which they could gain access to extra food or to smuggle goods able to be bartered. Within the camp there was little sense of solidarity among the prisoners. With so many languages spoken among the Jews there was much competition to find good jobs for oneself. A few of the characters in the book had siblings and relatives they formed supportive circles with but as a friend who helped Toivi, a young Polish Jew, to acclimate himself, explained to Toivi that “No one could survive for you” (119). This portrayal of the camp as a ‘dog eats dog’ world clarifies for the reader why there was indifference and self-centeredness. In the camp Jews became prejudiced towards one another; not only due to a difference in origin or religious faction but for fear of a guilt that could be placed upon them by association. The camp, as Rashke explains, broke down a prisoner’s psyche in such a way that they believed imprisonment at Sobibor was no longer real lifed. Things witnessed by the prisoners gave them no hope; they knew they were dealing with an absolutely unforgiving evil. The prisoners witnessed atrocity on a scale so great that hope should have been something incapable of being produced by their imagination. The Nazi guards killed Jews as if they were ants under a magnifying glass. Nevertheless, they continued to persist. The next level of resistance is the “Opposition”. This type of resistance was less common among the prisoners because with it came a higher risk of being identified as a resistor. An example of this kind of resistance would be Josel. Due to the importance of the skilled labor in the camp there was a great demand for a doctor. Josel was this doctor. As the sick Jews in the camp were afforded no more than three days to recover before their liquidation (German euphemism meaning to kill via gas chamber) Josel implemented a deceptive system, which could keep patients much longer giving them a chance to recover (106). For many Jews in the camp this person was a man who could save their lives and Josel’s system kept Jews “whole winters inside the barracks” and out of Camp III (the part of camp that housed the gas chambers). An interesting fact to note is the seemingly clairvoyant persistence of Jewish prisoners to tell the world about Sobibor as if they knew the death camp institution was going to be unbelievable. They knew that what the Germans were doing was unimaginable, Rashke explains, and that even they did not want to believe it was happening when they could see it taking place right in front of their eyes. For a select few, this Nazi inhumanity triggered something other than disbelief however. Some Jews like Sasha Pechersky, a Russian POW, witnessed this violation of his fellow Jews with an instant rage. As he heard a distant cry of a child and then its muffling he realized that “escape was not enough. He had to kill the Nazis and destroy their camp” (176). It was Jews like these that made it possible for the escape to succeed. The difference with Sasha was how he channeled his anger into a motivating force, because if he had stopped to analyze the entire situation it might have seemed impossible. With only his fellow prisoners he had to do battle with the Nazis, a group which would be very pleased to repress an escape attempt with mass killings. As Sasha knew this, he also knew that his escape would have to be perfectly planned, carefully publicized, and that it include only the shrewdest of the camp’s prisoners. Throughout the book Rashke tells the story of a man named Karski while simultaneously linking his story with historical fact. Karski, a Polish Catholic who served in the Polish Underground, agreed to help the Jewish underground by visiting a death camp and telling the world what he saw there. He met with the allied leaders and told them what he saw, but they would not print his story for fear of angering the Germans or suffering reprisals from their own citizens for not acting sooner as there had already been millions murdered. All the while the Allied nations were denying visas to Jews from all around the world even though they were fully capable of offering them refuse (129). Rashke explores the possibility of total indifference to the Jews’ situation in Europe. While governments stalled and the Pope refused to sign a public declaration detailing the Germans Final Solution, hundreds of thousands of Jews were being slaughtered (104). The rest of the world was kept in the dark, specifically the Jews. In light of the reports coming out of Eastern Europe it is quite amazing that anyone could be turning Jews away at their borders. There could be no immediate help expected from the rest of the world, but this was of little consequence to the Jews of Sobibor as they grew more restless to break their chains and escape in order to see what was happening. The further the war on Jews went on in Eastern Europe, the stronger the Jews of Sobibor became. As the workers in the camp held their positions longer and longer they had developed a toughness and greater hatred for their captors. One prisoner remarked, “at least I’m doing something,” explaining to another why even the smallest of sabotages helped (113). Rashke places a great importance on the need to make readers understand that these Jews who escaped were adamant about their need to resist. The prisoners needed a sense of agency in their existence; if they felt as though they had no control they would have given up. Eventually this need yielded a revolt and for some it brought a successful escape from SS guards’ persecution, although they received no mercy from most Polish inhabitants once they had escaped..
After escaping the Jews went from the mercy of the Nazis to the mercy of the Poles. Rashke writes of the Poles who were almost as anti-Semitic as the Nazis and would report escaped Jews in exchange for rewards. The repeated mentioning of this practice becomes more and more frustrating for the reader as the Jews never really escape. When asked about the trials of Sobibor Nazis one of the women from the camp ,Esther, simply said, “it was a joke… anti-Semitism clothed in judges robes” (324) These Jewish resistors never got a chance to rest from a fight with oppression. As soon as they made any headway there was another group waiting to inhibit their search for freedom and foil their mission to inform the world of the Germany’s Final Solution. All the same, the Jews from Sobibor fought this additional persecution with revenge as their new form of motivation. This kept them going until the Russians found their way into Poland, finally pushing the Germans back to the west. Historiography as a genre plays a crucial role in learning and remembrance. It helps new generations connect with the past, and this text does exactly that. Richard Rashke’s book Escape from Sobibor uses the actual accounts of Polish death camp survivors to recreate a Jewish prisoner’s perspective; a perspective that witnessed hundreds of thousands of murders and ultimately transitioned prisoners from frightened victims into ravenous revolutionaries. Peppered with outsider accounts from a Polish Catholic unusually sympathetic to the Jews, readers obtain an overview of the Second World War and its lack of concern for these prisoners inside the Sobibor camp. This account poses the question, as if it wouldn’t be asked based solely on the rest of the text, how could any European Jews - with such a high concentration of anti-Semitism in Europe, an entire army committed to their extermination and with the absence of any country courageous enough to stick up for these nation less people - survive the Final Solution? The answer to this question is given over and over again with each account of heroic resistance made by the Jews. Until the very end of the book these characters exhibit an undying desire to prove their right to an uninhibited existence.